Monocytes and macrophages express an extensive repertoire of G Protein-Coupled Receptors (GPCRs) that regulate inflammation and immunity. In this study we performed a systematic micro-array analysis of GPCR expression in primary mouse macrophages to identify family members that are either enriched in macrophages compared to a panel of other cell types, or are regulated by an inflammatory stimulus, the bacterial product lipopolysaccharide (LPS). Several members of the P2RY family had striking expression patterns in macrophages; P2ry6 mRNA was essentially expressed in a macrophage-specific fashion, whilst P2ry1 and P2ry5 mRNA levels were strongly down-regulated by LPS. Expression of several other GPCRs was either restricted to macrophages (e.g. Gpr84) or to both macrophages and neural tissues (e.g. P2ry12, Gpr85). The GPCR repertoire expressed by bone marrow-derived macrophages and thioglycollate-elicited peritoneal macrophages had some commonality, but there were also several GPCRs preferentially expressed by either cell population. The constitutive or regulated expression in macrophages of several GPCRs identified in this study has not previously been described. Future studies on such GPCRs and their agonists are likely to provide important insights into macrophage biology, as well as novel inflammatory pathways that could be future targets for drug discovery. Macrophages are key cellular mediators of acute and chronic inflammation. They can be defined on the basis of morphology, function (e.g. non-specific uptake of particles) and expression of specific cell surface markers (e.g. EMR1 that is detected by the F4/80 antibody). EMR1 belongs to the GPCR super-family , and it is clear that macrophages express a diverse repertoire of other GPCRs . A large number of GPCRs are yet to be deorphanized and hence, there is great potential for this family in both the discovery of gene function and in drug development. In this study we performed a systematic micro-array analysis of GPCR expression in primary mouse macrophages and identified family members that are either enriched in macrophages compared to a panel of other cell types, or are regulated by the pro-inflammatory stimulus, bacterial LPS. Some of these GPCRs are likely to provide future targets for drug discovery in inflammatory disease settings. Micro-array expression profiling across a panel of mouse and human tissues has enabled detailed analysis of tissue-specific gene expression . In this study, we analyzed the constitutive and regulated expression of GPCRs in macrophages by interrogating a more detailed micro-array dataset of 91 murine cell types and tissues [3, 4]. This data, available through NCBIs Gene Expression Omnibus ( accession number GSE10246), can also be used to probe gene expression profiles for an extensive array of other cell types. The cell and tissue panel included two of the most commonly used primary mouse macrophage models; bone marrow-derived macrophages (BMM) and thioglycollate-elicited peritoneal macrophages (TEPM), as well as microglia (a resident tissue macrophage population of the brain) and the widely utilized macrophage-like cell line, RAW264. We analyzed the expression patterns of all GPCRs as defined by the International Union of Basic and Clinical Pharmacology [6, 7]. We then compared the GPCR expression profiles of BMM and TEPM to the remaining panel of cell types, and in doing so, identified 67 GPCRs that were detectably expressed either constitutively or in an LPS-induced manner in these primary macrophage populations [see additional file 1]. In order to identify GPCRs that were very highly expressed by BMM and/or TEPM, we set an arbitrary cut-off in which normalised expression in either BMM or TEPM was at least 10-fold greater than the median normalised expression across all cell types. Using this very strict filtering approach, we identified 33 GPCRs that were enriched in BMM and/or TEPM as compared to the median normalised expression (Table 1 and 2). This, of course, does not mean that such genes are exclusively expressed by macrophages. For example, Gpr85 was highly expressed in several macrophage populations and was further up-regulated by LPS, but was also expressed in several regions of the brain (Figure 1a). Nevertheless, included in this set were GPCRs such as Emr1 (F4/80), C3aR, C5aR, Ccrl2 and Ccr2 that are known to be either macrophage-specific or highly expressed by macrophages [8–12], thus validating our approach. Also included in this list were a number of GPCRs (e.g. Edg5, P2ry2 and 6) that have not previously been reported to have a macrophage-restricted expression pattern (Table 2). As demonstrated in figure 1b, P2ry6 expression was strikingly restricted to macrophages and two cell types closely related to macrophages (osteoclasts and dendritic cells), whilst a number of other P2Y family receptors were also highly expressed by this lineage (Table 2). Consistent with this conclusion, we recently observed a macrophage-restricted expression pattern for P2ry6 mRNA in a much more limited analysis across seven different cell populations . Gpr84 expression was also largely restricted to macrophage populations and granulocytes (Figure 1c). Summary of GPCRs expressed by macrophages. Summary of GPCRs highly expressed or regulated in macrophages as assessed by micro-array analysis. Micro-array analysis was used to identify GPCRs that were highly enriched in primary mouse macrophages (BMM and TEPM). GPCRs identified as highly enriched in BMM or TEPM were defined as GPCRs where the normalised value was as least 10-fold greater and significantly different (p-value < 0.05, Student's two-tailed t-test) from the median expression across all cell types. GPCRs are grouped according to their class type on the basis of sequence similarity as previously described [65–67]. Macrophage-restricted GPCRs. Micro-array analysis of Gpr85 (A), P2ry6 (B) and Gpr84 (C) mRNA expression across a panel of 91 murine cell types and tissues. Data points show normalised values and similar cell types are grouped according to bar colour; blue indicates primary macrophage cell types, purple indicates bone-related cell types, red indicates other immune cell types, green indicates stem cell populations, orange indicates whole tissue samples, yellow indicates neuronal and retinal cell types and pink indicates cell lines. Additional file 3 gives details of the 91 cell types and tissues profiled. We also searched for GPCRs with differing expression patterns in non-inflammatory macrophages (BMM) versus inflammatory macrophages (TEPM). Those GPCRs that were highly expressed by BMM, but not TEPM, included Ebi2, Calcrl, Ccr2 and 5, Cxcr3, Cx3cr1 and Gpr84, whilst TEPM expressed much higher levels of Cxcr4, Gpr35, P2ry1, Ccr1, Cd97, Ccrl2 and Gprc5b (Table 2). As an example, figure 2a and 2b demonstrate the selective expression of Calcrl and Gprc5b in BMM and TEPM, respectively. The divergent expression patterns could, of course, reflect the differential growth state of the cells; BMM are cycling cells whilst TEPM are post-proliferative. Indeed, many of these genes showed similar expression profiles in BMM and RAW264 cells, both of which are proliferating macrophage populations. Nonetheless, there were also GPCRs that had distinct expression levels in BMM versus TEPM, as well as BMM versus RAW264. It is therefore unlikely that the differential expression of these genes in BMM versus TEPM is a reflection of the proliferative state of the cells. 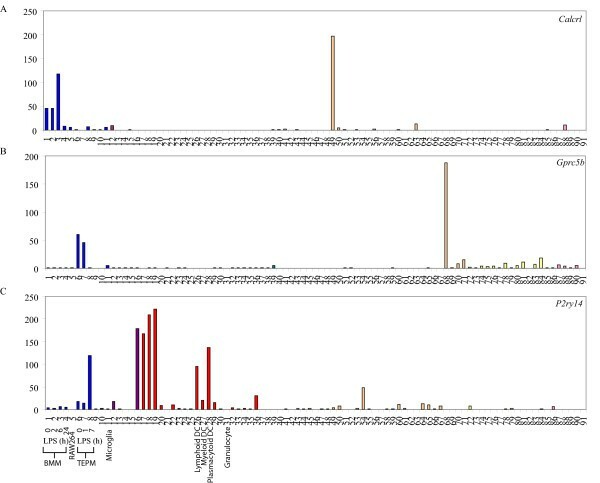 Examples of these include Ccr2, Gpr84 and Fprl1 that were selectively enriched in BMM as compared to TEPM and RAW264, whilst Gpr68 was enriched in both TEPM and RAW264 but not BMM. Such GPCRs may have distinct functions in macrophage differentiation, recruitment or activation. Apart from our analysis of macrophage-enriched GPCRs, we also identified several GPCRs (e.g. Gpr65, Ccr1, Ccrl1, Cnr2 and P2ry14) that were highly expressed by multiple leukocyte populations. As an illustration, figure 2c shows the immune-restricted expression of P2ry14. GPCRs differentially regulated in BMM and TEPM. Micro-array analysis of Calcrl (A), Gprc5b (B) and P2ry14 (C) mRNA expression across a panel of 91 murine cell types and tissues. Data points show normalised values and similar cell types are grouped according to bar colour; blue indicates primary macrophage cell types, purple indicates bone-related cell types, red indicates other immune cell types, green indicates stem cell populations, orange indicates whole tissue samples, yellow indicates neuronal and retinal cell types and pink indicates cell lines. Additional file 3 gives details of the 91 cell types and tissues profiled. LPS, the archetypal macrophage-activating stimulus that signals via toll-like receptor (TLR) 4, regulated the expression of several GPCRs in macrophages (Table 3 and 4). Whilst LPS is already known to regulate the expression of many of these (e.g. Gpr109b/PUMA-G, Fpr1, Ccrl2 and Ednrb) ([12–16], Sweet et al, unpublished data), regulated expression of others has not been widely studied. Examples of these include Fzd1, Htr2b, Gpr84 (induced by LPS, Table 3), and P2ry1 and 5 (repressed by LPS, Table 4). We recently validated the LPS-mediated repression of P2ry5 mRNA expression in BMM by real time PCR . Figure 3 highlights two examples of regulated GPCR expression: mRNA expression of Gpr84 was induced 10-fold by LPS (6 h) in BMM and 48-fold by LPS (7 h) in TEPM (Figure 3a), whilst P2ry1 was repressed 7-fold by LPS (6 h) in BMM and 18-fold by LPS (7 h) in TEPM (Figure 3b). GPCRs induced by LPS in macrophages. Micro-array analysis was used to assess the gene expression profile of GPCRs upon LPS treatment in primary mouse macrophages (BMM and TEPM). GPCRs regulated by LPS in primary mouse macrophages were defined as those that were 2-fold or greater up-regulated at 2, 6 or 24 h LPS in BMM and/or 1 or 7 h LPS in TEPM (and significantly different from controls, p-value < 0.05, Student's two-tailed t-test). Values shown depict gene expression relative to untreated control (0 h). GPCRs are grouped according to their class type on the basis of sequence similarity as previously described [65–67]. GPCRs repressed by LPS in macrophages. Micro-array analysis was used to assess the gene expression profiles of GPCRs upon LPS treatment in primary mouse macrophages (BMM and TEPM). GPCRs regulated by LPS in primary mouse macrophages were defined as those that were 2-fold or greater down-regulated at 2, 6 or 24 h LPS in BMM and/or 1 or 7 h LPS in TEPM (and significantly different from controls, p-value < 0.05, Student's two-tailed t-test). Values shown depict gene expression relative to untreated control (0 h). GPCRs are grouped according to their class type on the basis of sequence similarity as previously described [65–67]. GPCRs regulated by LPS in macrophages. 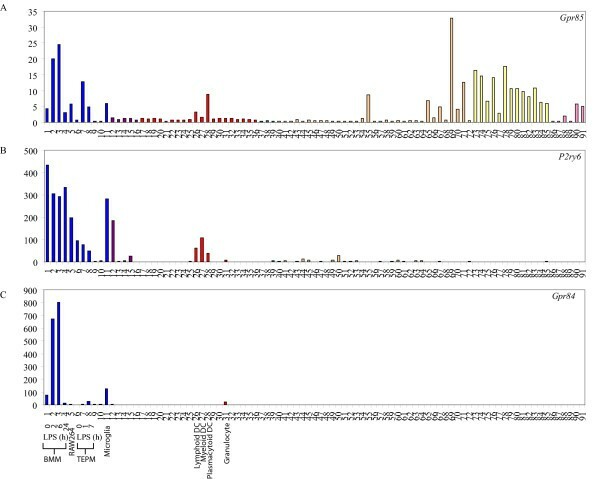 Micro-array expression analysis of Gpr84 (A), P2ry1 (B) and Prokr1 (C) mRNA in BMM and TEPM over a timecourse of 0, 2, 6, and 24 h, and 0, 1 and 7 h, respectively. Data points show gene expression relative to untreated control for each cell population (0 h). The LPS time courses studied in BMM (2, 6 and 24 h) and TEPM (1 and 7 h) were not identical and so it is difficult to make definitive conclusions about non-conserved regulation by LPS in these two cell populations. Nonetheless, we did identify genes that appeared to be differentially regulated by LPS in BMM or TEPM at similar time points. Gpr18, P2ry2, P2ry12 and Adrb2 were all strongly regulated by LPS in BMM, but not TEPM (Table 3, 4), whilst LPS regulated Gprc5b expression in TEPM, but not BMM (Table 4). 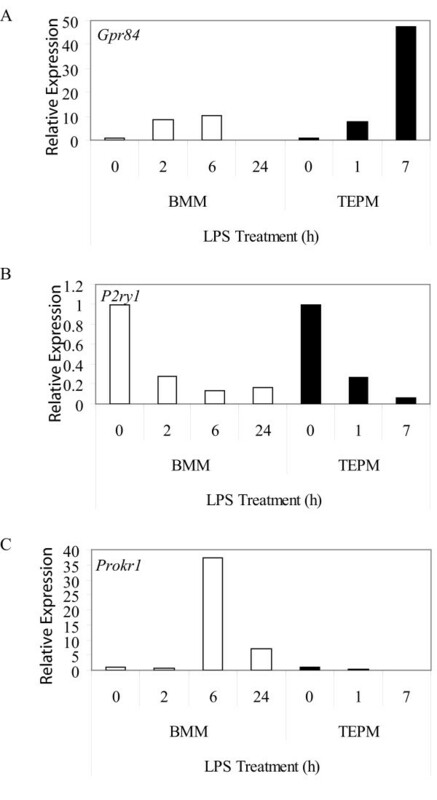 The effects of LPS could even be opposing in these two cell populations; Prokr1 was induced 37-fold by LPS in BMM (6 h), but repressed 20-fold in TEPM (7 h) (Figure 3c). Again some of these differences may be explained by the proliferative state of the cells; LPS triggers growth arrest in BMM and so some of the LPS-regulated genes unique to BMM may reflect this phenomenon. This is clearly not the case for all genes however (e.g. P2ry14 and Prokr1), thus arguing that subtle differences in LPS signaling pathways may exist in BMM versus TEPM. With an understanding of the GPCRs that are (a) highly expressed by the mononuclear phagocyte system, (b) selectively expressed by certain macrophage populations, or (c) regulated by the pro-inflammatory stimulus LPS, one can make some inferences about the role of specific GPCRs in macrophage biology. One of the most obvious findings from our analysis was that many of the P2Y purinergic receptors, which detect purine and pyrimidine nucleotides, were expressed in a restricted and/or regulated fashion in macrophages. Mechanical stress, cellular injury, inflammatory stimuli such as LPS, degranulation of mast cells and hypoxia can all increase extracellular concentrations of ATP and UTP [17–20]. Consequently, these receptors are very likely to impact upon macrophage-mediated inflammatory responses. Of the P2Y family, perhaps most striking in its expression pattern was P2ry6, which was essentially restricted to cells of the myeloid lineage. P2ry6 mRNA levels were greatly elevated in BMM, TEPM, RAW264 cells, microglia, osteoclasts and dendritic cells, compared to all other cell types (Figure 1b). P2ry6 expression in osteoclasts, which are a closely related lineage to macrophages, has been confirmed by others . Whilst no previous studies have indicated that P2ry6 expression is restricted to the monocyte/macrophage lineage, there is evidence to suggest that this receptor does regulate the function of macrophages. UDP, which is reportedly a selective P2RY6 agonist [22, 23], triggered interleukin (IL)-8 release from the human monocyte-like cell line, THP-1 . Conversely, the P2RY6 receptor antagonists, anthraquinone-sulfonic acid derivative reactive blue 2 and suramin, inhibited LPS-induced IL-8 production by THP-1 cells . In microglia, P2ry6 mRNA expression was up-regulated in response to neuronal damage and UDP promoted phagocytosis by microglia, thus implying a role for P2RY6 in the clearance of damaged or dead neuronal cells . Our observation that this receptor is widely expressed in the mononuclear phagocyte system suggests that this receptor may have a broader function in sensing and engulfing damaged cells throughout the body, as well as promoting pro-inflammatory responses in response to LPS and/or UDP. This laboratory previously reported that P2ry5 mRNA expression was dramatically repressed by LPS in human and mouse macrophages , a finding supported by micro-array data presented here. This receptor was originally classified as a member of the P2Y receptor family on the basis of sequence identity and its ability to bind the nucleotides ATP and ADP . Nucleotides failed to initiate downstream signaling from this receptor however , and it is therefore possible that P2RY5 acts as an antagonist of other P2Y receptors and restricts the macrophage response to extracellular nucleotides. Down-regulation of P2RY5 in response to a macrophage activating stimulus such as LPS might remove this inhibitory effect, thus allowing activated macrophages to respond to nucleotides. Alternatively, it is possible that the initial assignment of P2RY5 as a P2 receptor was incorrect. Cross-genome phylogenetic analysis showed that it clustered with a heterogenous group of receptors including the protease-activated receptors, as well as lysophosphatidylcholine (LPA) and sphingosylphosphorylcholine (S1P) receptors, rather than with other P2Y receptors . In this case, LPS-mediated macrophage activation would presumably render cells unresponsive to the true ligand for this receptor. Emerging evidence also implicates other P2Y receptors in macrophage-mediated inflammatory responses. For example, extracellular ATP, an agonist of P2RY2, induced IL-6 transcription in human monocyte-derived macrophages  and chemotaxis in human neutrophils , while the P2RY1 agonist 2-methylthio ATP increased IL-6 secretion from mouse splenocytes . In support of a role for P2Y ATP receptors in macrophage function, and consistent with our data, P2ry1 and P2ry2 mRNAs were expressed at high levels in macrophages and LPS-stimulated monocytes . Apart from these P2Y family members, P2RY12 was also reported to be selectively expressed in microglia in the rat brain . Our analysis also showed that this receptor was highly enriched in microglia, as well as BMM, plasmacytoid dendritic cells, osteoclasts and a variety of lymphoid and neural tissues [see additional file 2a]. Finally, the P2Y-like receptor, P2ry14 (Gpr105), which is a receptor for UDP-conjugated sugars, mediated chemotaxis of bone marrow hematopoietic stem cells . Despite the emerging literature that suggests a role for P2Y receptors in macrophage-mediated migration and inflammatory responses, a clear understanding of the selective agonists of these receptors and their interplay with each other and non-P2Y receptors is lacking. Nonetheless, our demonstration of the restricted and regulated expression of this family in macrophages identifies them as promising candidates for further analysis. Other GPCRs that had a relatively restricted expression pattern and were strongly expressed by macrophages include Edg5, Gpr85 and Gpr84 (Table 2, Figure 1a and 1c, Additional file 2b). Edg5 is one of eight members of the endothelial differentiation gene (EDG) family of GPCRs that recognize LPA and S1P . Several studies have documented potent effects of the EDG5 ligand, S1P on macrophages. Rat alveolar macrophages responded to S1P by producing O2 - at levels comparable to those induced by LPS or formyl-Methionyl-Leucyl-Phenylalanine . Not surprisingly, given this finding, anti-microbial effects of S1P have been reported. In human monocyte-derived macrophages or THP-1 cells infected with M. smegmatis or M. tuberculosis, S1P reduced intracellular bacterial loads in a dose-dependent manner. Similar effects of S1P were also apparent in mice infected with M. smegmatis or M. tuberculosis . Apart from activating anti-microbial responses, S1P also provided a survival signal to both mouse and human macrophage cell lines upon subsequent exposure to an apoptosis-inducing signal . EDG1 was implicated in this response, but given the high expression of Edg5 reported here, this receptor may also be involved in macrophage responses to S1P. Expression of the SREB (super conserved receptor expressed in brain) family member Gpr85 (Sreb2) was restricted to macrophages and neuronal tissues (Figure 1a). Whilst the expression of Gpr85 in the central nervous system was previously reported [38–40], a function has yet to be identified. The co-regulated expression of receptors such as Gpr85 in neural tissues and leukocyte populations may provide a mechanism for the neuro-immune cross-talk that has been observed in several studies [41, 42]. Gpr84 is an orphan GPCR that was strikingly restricted to BMM and microglia in an unstimulated state (Table 2, Figure 1c) and was strongly up-regulated by LPS in both BMM and TEPM (Figure 3a, Table 3). This up-regulation is consistent with elevated Gpr84 expression in microglia and tissue macrophages in an endotoxin shock model . Microglia also expressed high levels of Gpr84 in the experimental autoimmune encephalomyelitis model of multiple sclerosis . These data imply that GPR84 has a role in neuroinflammation, but the exact function is difficult to predict without any knowledge of a ligand. Nonetheless, given the highly restricted expression pattern of Gpr84 mRNA, antibodies against this receptor may provide useful tools for tracking macrophage populations in vivo. As with Gpr84, mRNA for several other GPCRs, particularly chemokine receptors, were differentially expressed between various unstimulated macrophage populations. TEPM expressed elevated levels of mRNA for Cxcr4, Ccr1, Ccrl2, whilst BMM expressed higher levels of Ccr2, Cx3cr1 and Cxcr3. The fractalkine receptor CX3CR1 has been identified as a marker of patrolling monocytes that survey the endothelial surface  and its down-regulation on macrophages that have already trafficked to an inflammatory site is not surprising. Conversely, CXCR4 has a well-characterized function in targeting leukocytes and their progenitors away from the circulation , consistent with its enhanced expression in TEPM. Apart from chemokine receptors, the expression of a number of other GPCRs was different between BMM and TEPM. For example, the thrombin-related receptor, Ebi2 , was strongly expressed in BMM but not TEPM, whilst Gprc5b was enriched in TEPM but not BMM. Such differences are likely to contribute to functional divergence between tissue macrophage and inflammatory macrophage populations. Many of the GPCRs that were highly expressed by macrophages in an unstimulated state (described above), were also regulated by LPS. Several other GPCRs were weakly expressed by unstimulated macrophages but were strongly regulated by LPS. One such example was the frizzled family member, Fzd1. Frizzleds (Fzd) represent the cell membrane receptors for a family of secreted glycoproteins called wingless-related proteins (WNTs). Wnts play essential roles in development, including cell fate determination, adhesion, polarity, migration and proliferation [47–50]. The WNT family has also been implicated in immune regulation. For example, the WNT family member, WNTD, acted as a negative feedback regulator of Toll signaling in Drosophila . In human macrophages, WNT5A expression was up-regulated by TLR ligands, as well as challenge with M. tuberculosis and M. avium, and the WNT5A/Frizzled-5 (FZD5) pathway promoted IL-12 production from peripheral blood mononuclear cells . The striking up-regulation of Fzd1 in BMM (17-fold at 6 h LPS) implies that this FZD family member shares similar functions in regulating macrophage inflammatory responses. We also identified several GPCRs that were differentially regulated by LPS in BMM and TEPM. In BMM, Prokr1 was transiently induced by LPS (37-fold at 6 h) but repressed in TEPM (20-fold at 7 h). PROKR1 is a receptor for prokineticin 1 (PK1), a peptide that regulates monocyte differentiation, as well as macrophage activation and migration. PK1 triggered the differentiation of both murine and human bone marrow progenitor cells into the monocyte/macrophage lineage , and reprogrammed the response of human monocytes to LPS by amplifying IL-12 and tumor necrosis factor alpha (TNF) production, but inhibiting IL-10 release . The differential regulation of Prokr1 by LPS in BMM versus TEPM implies that this receptor has distinct functions during activation of tissue versus inflammatory macrophage populations. Gpr18 was induced 52-fold in BMM following 6 h LPS exposure, while it remained unchanged in TEPM. This receptor was also highly expressed in other immune cell populations including B cells, T cells and DC cells [see additional file 2c]. N-arachidonylglycine (NAGly), a conjugate of arachidonic acid and glycine, is an endogenous ligand for GPR18  that was reported to suppress inflammatory pain and have analgesic properties [55, 56]. Given the potent regulation of Gpr18 expression in BMM by LPS, NAGly is also likely to regulate macrophage function. The adenosine receptor, Adora2b was also strongly induced by LPS in BMM (191-fold at 6 h) yet was only modestly regulated (3-fold at 7 h) in TEPM. Adenosine-mediated activation of this receptor augmented IL-10 production by RAW264 cells in response to LPS . In contrast, adenosine attenuated LPS-induced production of the pro-inflammatory cytokines TNF [58–61] and IL-12 [60, 62] in mouse and human macrophages. Inducible Adora2b expression may therefore contribute to feedback regulation of macrophage inflammatory responses. In this study, we have documented several GPCRs that are detectably expressed in primary mouse macrophages (BMM, TEPM), enriched in either or both BMM and TEPM, or regulated in activated macrophages (LPS-stimulated BMM and/or TEPM). For some of these genes, constitutive or regulated expression in macrophages has not previously been described. Future studies on such GPCRs and their agonists are likely to provide important insights into macrophage biology, as well as novel inflammatory pathways which could be future targets for drug discovery. All cell lines and tissues were sourced from 8–10 week old male C57Bl/6 mice, with the exception of female-specific organs, which were sourced from female mice. All procedures were carried out in accordance with local guidelines for animal research. For female tissues, material was pooled from three females and for each female an average four embryos resulting in four umbilical cords and placentas were obtained. For other tissues, material was derived from a pool of three males. Biological replicates were defined as independent RNA preparations from independent pools of mice. Technical replicates were defined as independent amplifications from the same RNA sample. The full list of cell lines and tissues profiled, as well as further details on biological versus technical replication, is provided in additional file 3 (key to figures 1, 2 and additional file 2). Mouse BMM were prepared from bone marrow cells from femurs of adult C57Bl/6 mice by culturing for 7 days in complete medium (RPMI containing 10% FCS, 20 U/ml penicillin, 20 μg/ml streptomycin and 2 mM L-glutamine (Invitrogen) in the presence of 10 000 U/ml CSF-1 (a gift from Chiron, Emeryville, CA) on bacteriological plastic plates. On day 7, BMM were treated with 10 ng/mL Salmonella minnesota LPS (Re595 mutant, Sigma) for 2, 6 or 24 h, and RNA was extracted. To generate TEPM, cells were harvested from the peritoneal cavity of C57Bl/6 mice 3 d after i.p. administration of 3% thioglycollate broth (Difco). Cells were then plated onto tissue culture plastic for 2 h, after which time non-adherent cells were removed by washing with PBS. Adherent TEPM were then treated with LPS for 1 or 7 h, or were left untreated, and RNA was extracted. Microglia were generated from cultures of mixed cortical cells. After 10 d culture, microglia were separated from astroglia by shaking on an orbital shaker (180 rpm, 20 min, 37°C) in the presence of 12 mM lidocaine (Sigma). RNA extraction from mammalian cells or tissues was performed using RNeasy kits (Qiagen) or the standard Trizol protocol. If tissue amounts were more than 50 mg per mouse when dissected, tissues were pulverized while frozen. RNA was prepared separately for every mouse in order to identify samples with potentially degraded RNA. Trizol-extracted RNA was purified with a Qiagen RNeasy column. For BMM, osteoblasts and osteoclasts contaminating genomic DNA was removed during the RNeasy cleanup using DNaseI (Qiagen). The integrity and concentration of RNA was determined via microfluidic analysis on a bio-analyser (Agilent Technologies) or by analysis on a BioRad Experion (BioRad). Pooling occurred at the RNA level. For samples containing more than two μg total RNA available after pooling, standard Affymetrix single amplification was performed using two μg total RNA. For pooled samples containing less than two μg total RNA, 100 ng total RNA (or 50 ng for thymocyte SP CD8+) was used in a standard Affymetrix double amplification protocol. The starting quantity of RNA for specific tissues is included in additional file 3. Standard Affymetrix protocols were used to process Affymetrix MOE430_2 microarrays. All CEL file images were processed as a single group using gcRMA [63, 64], after which the data for each gene was rescaled using per-gene normalisation to the median (for tissue specificity analysis) or per-gene normalisation to untreated control samples (for analysis of BMM and TEPM gene regulation by LPS). The microarray data described have been deposited in NCBIs Gene Expression Omnibus  and are accessible through GEO Series accession number GSE10246. GPCRs identified as highly enriched in BMM or TEPM were defined as transcripts where the normalised expression value was as least 10-fold greater in BMM/TEPM when compared to the median expression across all cell types and where BMM/TEPM expression significantly deviated from this median value (p-value < 0.05, student's two-tailed t-test). GPCRs regulated by LPS in primary mouse macrophages were defined as those whose normalised expression values were two-fold or greater up- or down-regulated at any point in the time course (2, 6 or 24 h LPS in BMM and/or 1 or 7 h LPS in TEPM) compared to the unstimulated state (0 LPS). LPS regulated genes were also filtered on the basis of statistical significance (p-value < 0.05, student's two-tailed t-test). All statistical testing was performed using the GeneSpring GX software, with the cross-gene error model function enabled. This work was supported by NHMRC Dora Lush and Queensland Government Smart State Fellowships to JL. A portion of this work was supported by the Novartis Research Foundation. JL carried out filtering and analysis of the GNF microarray expression data and drafted the manuscript. KS carried out the extraction of the microarray expression data and participated in the design of the study and review of the manuscript. AS, JZ and JW generated GNF microarray expression data. KS and CG purified cell populations and generated RNA for microarray analysis. DH and SK assisted in the review and editing of the manuscript. MS participated in the design of the study and drafting of the manuscript. All authors read and approved the final manuscript.